With 1,235 page views of this recipe I absolutely could not leave it up with that sad little picture of pumpkin cheesecake. Welcome to another Recipe Remake. 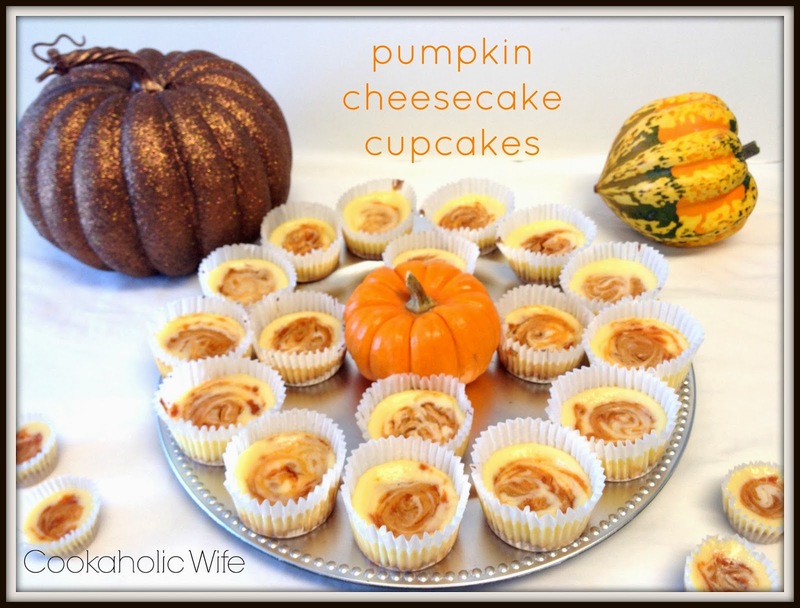 While I have tons of new recipes I could share with you, we are smack-dab in the middle of all things pumpkin and apple, so I decided it was the best time to share these remade recipes with you. I opted to lighten this up a little bit by using fat-free cream cheese and sour cream, but you are more than welcome to use the half of full fat varieties of both. You honestly can’t taste the difference. 1. Preheat the oven to 325. Line two cupcake pans with paper or foil liners. 2. Add the graham crackers to a food processor and pulse until crumbs form. Add in the butter and sugar and pulse again until the mixture is moist. 3. Drop heaping tablespoons of the crust into each liner. Use a glass or other flat object to press the crust down into the liner. Bake for 7 minutes, then let cool on a wire rack while you prepare the rest of the recipe. 4. Combine cream cheese and sugar in the bowl of your stand mixer and beat on medium speed until light and fluffy. Add in the eggs, one at a time, making sure it is fully combined before adding in the next egg. Finish by adding in the vanilla and pinch of salt. The mixture should be somewhat runny. 5. Spoon 1 1/2 tablespoons of the cream cheese mixture into each cupcake liner. They should be about halfway full. 6. In a small bowl, whisk together the pumpkin puree, sour cream and sugar until combined. 7. Drop teaspoon sized dollops of the pumpkin mixture into the center of each cupcake liner. Use a toothpick to swirl. 8. Bake for 12 minutes then rotate the pans and bake for another 12-14 minutes. Let cool completely on wire racks, then transfer to the refrigerate until ready to serve. This revised version of the recipe definitely left me with a lot extra of all of the ingredients. If you have a lot of the cream cheese mixture left, it won’t hurt to fill the cupcakes higher. They are going to rise while baking and then fall once they begin to cool. I only wish I would have taken a picture before they fell. The fallen versions are still nice, but they looked like clouds of cream cheese swirled with pumpkins when I first took them out of the oven and I would’ve loved to share that. A couple of weeks ago I made Raspberry Swirl Cheesecake Cupcakes that I found on Annie’s Eats. It was my first time ever making cheesecake. 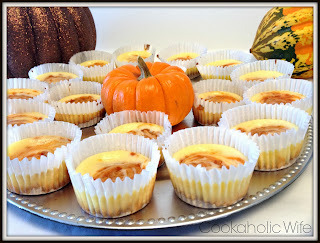 They were so good and the recipe was so easy that I decided I would use pumpkin instead of raspberry and make them for Thanksgiving. 1. Preheat the oven to 325. Line cupcake pans with liners. 2. Use a food processor to grind up the graham crackers. Melt the butter. Add the sugar and butter to the graham cracker crumbs. 3. Put 1 tbs. of the graham cracker mixture into each cupcake liner. Use a glass to press down. Bake for 5 minutes and then transfer to a cooling rack. 4. Using the paddle attachment in a stand mixer, beat the cream cheese on medium speed until fluffy. Add the sugar and mix until smooth. Add the vanilla and the salt. Next, add the eggs one at a time making sure that they are fully combined before adding the next one. 5. Scoop approximately 1 1/2 tbs. of the cream cheese mixture into each of the cupcake liners. 6. In a medium bowl, combine the pumpkin, sugar and sour cream. Stir until well combined. Scoop approximately 1 tsp. of the pumpkin mixture into the center of the cheesecake. Swirl with a toothpick. 7. Bake for 25 minutes, rotating the pan half way through. Let the cupcakes cool to room temperature on cooling racks, then transfer to the refrigerator and chill for at least 4 hours. DELICIOUS! I bet you can’t eat just one!